I simply don’t feel up to tackling the Kalam argument this week, or writing about much of anything, really. Sorry. Hopefully I’ll get over it in time to invent some content for Friday. We’ll see! I confess to being guilty of most of these. I’ve been having a great deal of difficulty handling life lately, or the last couple of days, anyway. I have a full time job; my boyfriend is unemployed. In theory, I’m fine with him not working. In reality, it causes a lot of emotional badness. He and I have talked about it several times, so I’m not about to say anything he doesn’t know. Most of my issues with my being the main financial support for the two of us and our household stem directly from my strict conservative upbringing. I no longer intellectually agree with the idea that the man has to be the support, but it seems I still expect it. I’m not sure if it is just what I was taught to want or what I actually want. In any case, my being the “man” in the relationship (at least in this way) really isn’t something I’m willing to continue doing indefinitely. As I expressed it the other night to my boyfriend, “This was never part of the deal.” There’s also the factor that my parents taught me that if a woman lets a man live with her, and especially if she’s supporting him, he won’t ever find a job and will just take advantage of her forever. I don’t believe it is the norm, but it is simply the case that my boyfriend has done nothing to dispel the idea. We’ve been living together for almost a year and a half, and he has only gotten one interview. That’s not a sign of someone looking for a job, and even if he has legitimate reasons (he does to an extent), this is still a source of strain. There’s also the fact that I never wanted an actual career like this. My dream since I was about 11 has always been to write for a living. Starting this blog reawakened that passion, and now I feel trapped in a job I never wanted that’s preventing me from following my goals. Not only that, but I feel like my boyfriend isn’t doing anything to help support that dream. He doesn’t even normally read this blog, although talking about the various theological arguments with him is sometimes (often) how I decide what to say. It’s very difficult to articulate exactly how I’d like him to be a support of this dream, other than I’d prefer he be the wage earner so I could have time to pursue it, so I can’t really ask him to do anything specifically different. Arg. It’s just frustrating. I don’t even hate my job, although it has been tedious most of the time these last few weeks. I hate a lot of the parts of it (spending most of the last week fighting with my work computer might have been the main driving factor behind this outburst), but what I like least is that I actually have to do things and sometimes be places certain times, and that’s just part of having a steady job. We have expenses; one of us needs steady work, at least unless/until we program the next great mobile app (we both graduated in the computer programming field) or I write a book that sells a few million copies. For the record, lest anybody get the wrong idea, this is the only major problem he and I have. Everything else we even kindof fight about boils down to bad communication skills, and I think we’re both aware enough of that to make it not that big of a deal. He has been making YouTube videos about games, and they are sometimes pretty funny. Just to end on a happy note, we went to the pet store over the weekend and found three new friends! We ended up taking home a little grey mouse because he likes mice and two gerbils because I think they’re cuter than mice, hamsters are mean, and we don’t really have room for anything else. I like how they haven’t pooped on me so far. Now we have a black mouse, a grey mouse, a brown gerbil, and a grey gerbil. The mice are female and the gerbils are male, which means we could in theory make some crazy hybrid if they were genetically similar enough. 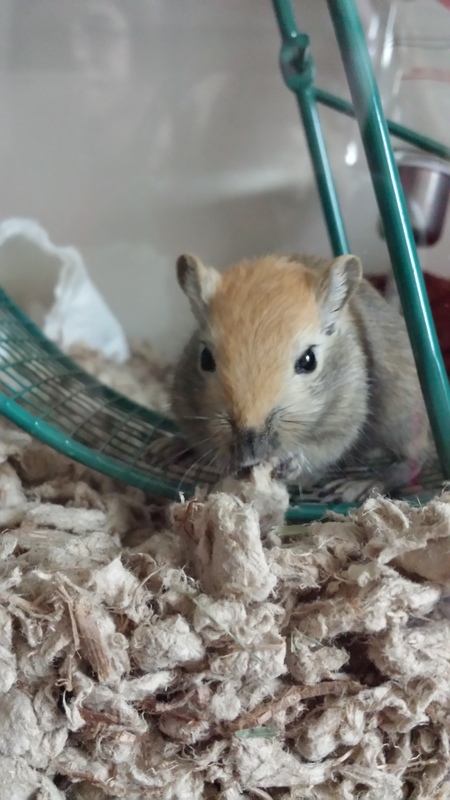 A friend suggested the name Radagast for this gerbil and Gandalf for the other one, and I love the idea, but the names seem too grand for everyday use on such tiny creatures. Stop eating the bedding, Radagast! I can absolutely relate to you, here. Growing up in a very conservative home, I always had the expectation that I was supposed to be the bread-winner of the household. This came to a head, years ago, as I butted up against the realization that I would not be able to support a family in the way I had always imagined. Even more jarring was the fact that my girlfriend had absolutely no intention of being a homemaker, and would likely be earning a good bit more money than me. Here’s the moral of the story, though. That all occurred about seven years ago. My girlfriend is now my wife, and she absolutely earns a lot more money than me. You’ll go through some trying times, but the key is to work together in order to resolve them as a family. It’s all too easy for both of you to fall into the mindset of thinking about your own needs and desires. It’s a worthwhile exercise for both of you to sit down and discuss, calmly, how each of you can work to better your lives, together. I know I’m a complete Internet stranger, but I hope this can be helpful to you, and that everything works out! Thank you for your kind words. I think we can make it work out, but it is, as usual, not as easy as I expected.